Move over Babies R Us and Target. There is a new brand of boutique baby apparel that is catching the world by storm- Fayebeline. Fayebeline offers truly one-of-a kind products that are the hit of the baby shower and turn any baby into the center of attention. With hip designs often printed in gold and silver foil like “I Only Date Models” and “I Drink Until I Pass Out”, it is no secret why the Fayebeline product line is so popular. This company is truly the alternative to the big box stores and offers memorable gifts for new parents; including great baby shower gifts. In addition, the company also offers a toddler line, seasonal products and even cute accessories. In addition to the rave reviews and unique line, the company also firmly believes in giving back. For every purchase, the husband-wife team donates baby clothing to a family/child in need. While the success of Fayebeline can most certainly be measured by sales and the numerous reviews, the company owners measure their success by giving back. In their first six months of business in 2015, Fayebeline donated $1,000 to the I Have A Dream Foundation. This year they are committed to doing even more. Fayebeline just announced their “Get One Give One” campaign, which promises that every purchase will be matched with a donation to a child in need. The company owners are finalizing their charity selection for 2016 are even encouraging their website visitors to submit suggestions. Babies are a blessing - no doubt. This onesie is stunning. The gold foil printing pops off the aqua fabric. Perfect for a baby baptism, baby blessing, or christening gift. THE PERFECT ONESIE - Hip, edgy, and clever designs are only the beginning. 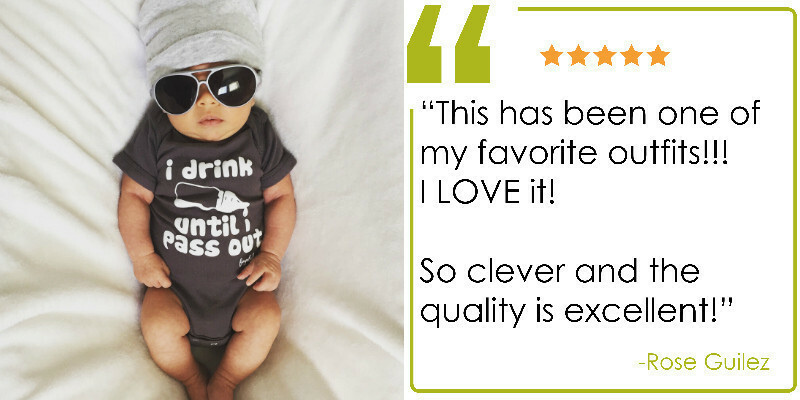 Fayebeline onesies are made from the softest available boutique quality cotton, 30% thicker than most traditional multi-pack onesies. You will not find any thin see-through material in the Fayebeline collection. The idea for Fayebeline was born shortly after we welcomed our daughter Faye into our lives in March 2015. We wanted to create unique, boutique-quality baby apparel that would make a statement without sacrificing style. Fayebeline clothing is designed for people who think baby clothing can be hip, edgy, and clever. Our experience on the parenthood journey is our inspiration, and the profits from Fayebeline go straight into the college fund. We also make quarterly donations to charities that support the health, wellness, and education of children. I love the " I Drink Until I pass Out" onsie. I like the Fayebeline "I'll Have Your Finest House White" Funny Baby Onesie Gift, Grey onesie. I like the I Only Date Models onsie! I like the I drink until I pass out onesie! I would choose the Blessed onesie in Aqua and Gold Foil.